The last big thing we didn't know about the Subaru BRZ? Horsepower. A big deal because it was still unclear just how mechanically similar it would be to the Toyota GT 86. Well, it turns out they make an identical 197 HP and 151 Lb-Ft using the same boxer four. That's no bad thing. The 2.0-liter boxer has an perfectly square 86 X 86 mm bore and stroke, meaning it should be capable of revving into absolute infinity. Expect peak power to be way up that rev range, but it'll be interesting to see how far the distance between that and peak torque will be, telling us how flexible this all-new, direct-injection motor is. The BRZ weighs just 2,689 Lbs at the curb, making it one of the lightest-weight sports cars available. The convertible Miata weighs 2,410 Lbs and makes just 158 HP. The Subaru will be faster. The car is just 51 inches tall and is 70 inches wide, yet has room for 2+2 seating and a hatch over a relatively generous trunk. So basically it's nearly as light at the Miata with more practicality than a 370Z. This is really shaping up to be an utterly awesome, 21st century rendition of the long-forgotten ‘70s and ‘80s Japanese sports coupes. 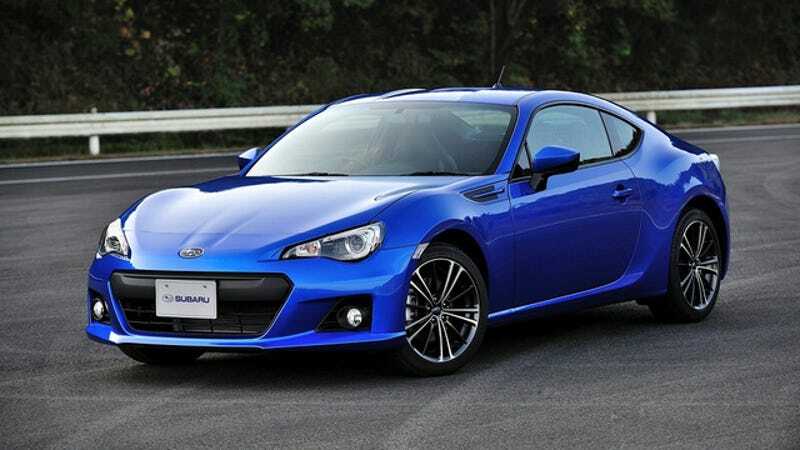 Of course, for us Americans it'll likely be a choice between the BRZ and the Scion FR-S. Maybe that'll make it cheaper.